The global maternal mortality ratio is currently estimated at 210 maternal deaths per 100,000 live births (WHO, UNICEF, UNFPA, World Bank 2014). Globally, 289,000 women die every year, of which, 286,000 deaths occur in developing countries. Sub-Saharan Africa has the highest proportion of maternal deaths which account for 62% of all the global deaths reported (2014). 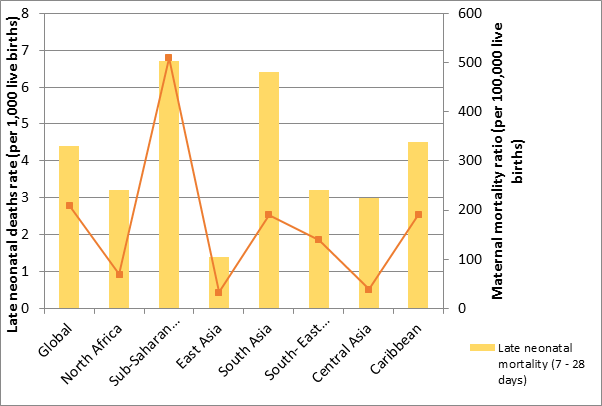 Figure 1.6 below shows maternal mortality ratio at global and regional levels (as classified by the WHO). Data sources: WHO, UNICEF, UNFPA, The World Bank and the United Nations Population Division 2014. The global early neonatal mortality rate is currently estimated at 14 deaths per 1,000 live births, and 4.4 deaths per 1,000 live births for late neonatal deaths (7-28 days). 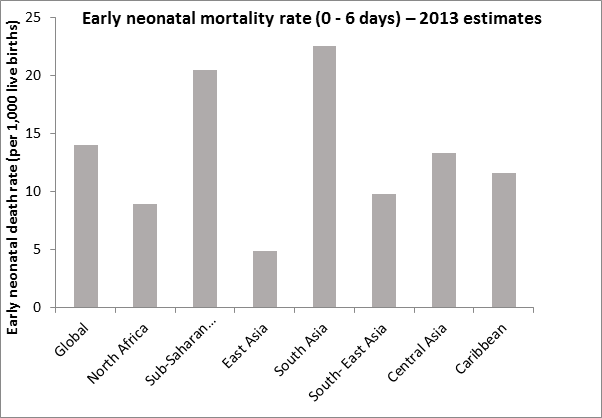 Aggregated neonatal deaths account for 41.6% of all the deaths that occur among under 5s (0-4 years) globally. 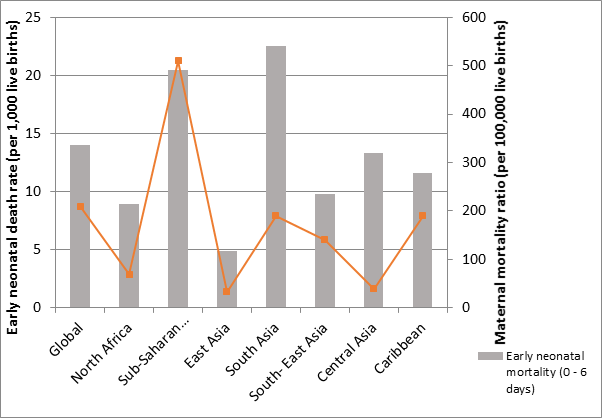 Figure 1.7 below shows early neonatal mortality rate at global and regional levels (as classified by the Global Burden of Disease Study 2013, which also overlaps with the WHO classification). Data sources: Wang, H., Liddell, C., Coates, M., Moobey, M., Levitz, C et al 2014. There are established and documented associations between maternal survival and child outcomes. These include clinical associations such as obstetric complications contributing to stillbirths and early neonatal deaths, and other repercussions such as low survival rates of infants following the death of their mother. 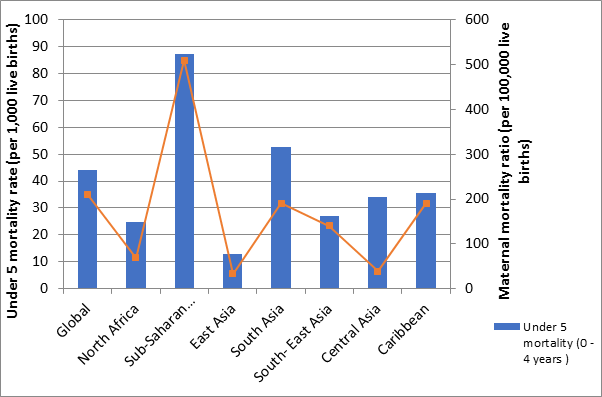 Figures 1.8, 1.9 and 1.10 show global and regional variations in the maternal mortality data, overlaid with key neonatal and child indicators. Data sources: WHO, UNICEF, UNFPA, The World Bank and the United Nations Population Division 2014. | Wang, H., Liddell, C., Coates, M., Moobey, M., Levitz, C et al 2014. 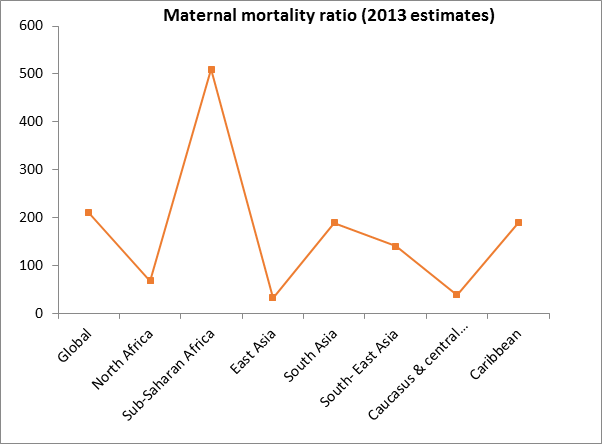 Take a closer look: what is striking about the data on maternal mortality and newborn health? There is a link between maternal mortality and the wellbeing of newborns and children. The earlier graphs suggest a relationship between levels of maternal mortality and early neonatal mortality (first week of life), which would be expected given the close links between the health of a mother and the newborn. Although the correlations are not always consistent, the link appears to extend into the late neonatal period (from day 7 up to the 28th day of life) and in children under five years old. One reason for this association is related to the access to healthcare. A woman who can reach good quality health services is likely to benefit from care which allows for early detection and management of complications for herself and her child, should these arise. Another reason for the observed correlations is that a child is more likely to receive better care if its mother is alive (e.g. breastfeeding and better nutrition). Socio-economic factors are also likely to play a part. Note how the trend in South Asia appears to differ from the global pattern. The Wang et al analysis of the global burden of disease notes that the largest decrease in the number of under-5 deaths was in south Asia, however progress was less than expected in the reduction of child deaths. Consider your own context: What linkages are there in your country between maternal, neonatal and child health? What do you think accounts for them? There is clearly a link between the health of the mother and newborn child and the evidence is also showing a link to late newborn. Do you also see connections to the education and socio-economic status of the Mother? To what extent is increased access in your context due to levels of knowledge and disposable income to pay for transport and user fees?